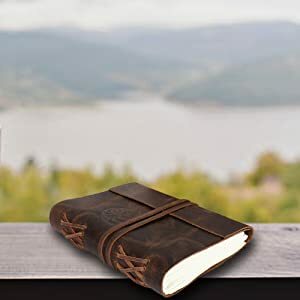 •✅ WRITE IN STYLE: This vintage handcrafted journal is made from 100% soft, hard wearing water buffalo leather. Oozing rustic charm, as well as that gorgeous leather smell, the antique looking style gives it an old-world feel to help inspire your writing. 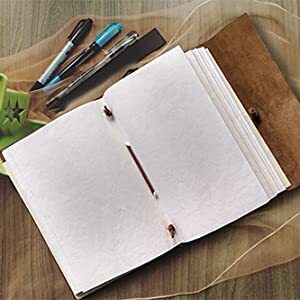 •✅ THE PERFECT GIFT FOR WOMEN WRITERS AND TEEN GIRLS: Draw, write and sketch to your heart’s content on the 120 off-white blank unlined sheets (or 240 pages). 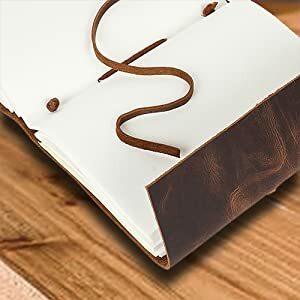 Our dark brown leatherbound notebooks make heartwarming birthday, anniversary, valentine's, graduation, engagement or wedding gifts. •✅ FOUNTAIN-PEN FRIENDLY PAPER THAT WON’T BLEED-THROUGH: We use high quality, acid-free cotton paper that’s best for art, notes or journaling. The 125gsm paper takes pen or heavy pencil beautifully and is thick enough to prevent any bleed through. 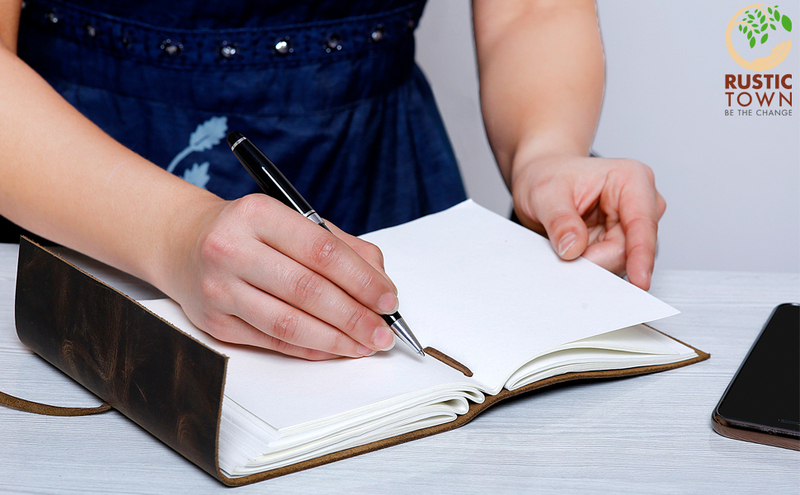 These womens journals are not refillable. •✅ TAKE ANYWHERE: The 7”x5” size sketch book can be easily carried with you. These old fashioned leather-bound sketchbooks fit in most purses, backpacks, and totes. The strap keeps your personal planner closed. Perfect for writers, travelers and journalers traveling on the go. •✅ THERE’S NO RISK TO YOU: In the unlikely event you don’t absolutely love your sketchbook, you have up to a year to ask for a full refund or free replacement. 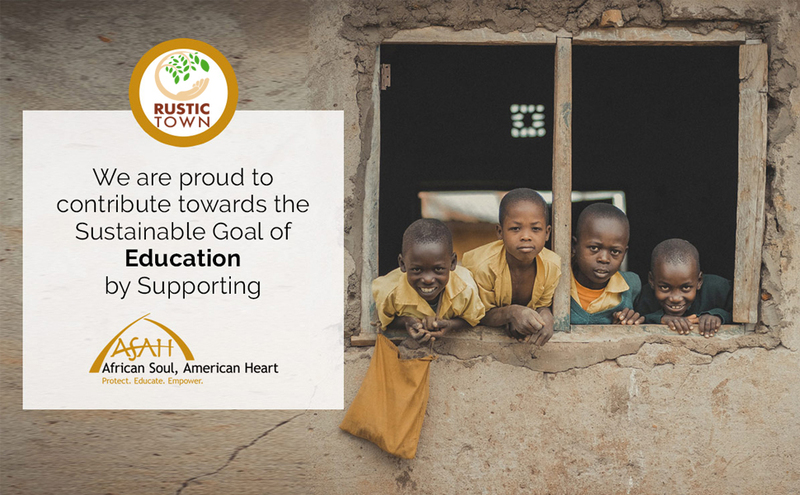 Plus we donate a percentage of our profits for child education in Africa. What’s not to love about that! Approx. Pages 240 pages counting on both sides. 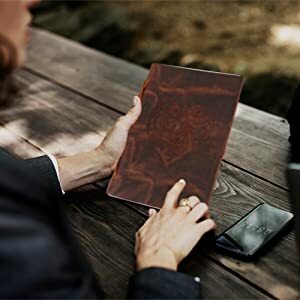 This luxurious antique leather notebook is 100% handcrafted with care every step of the way to ensure it’s a leather journal to treasure for men, women, students, journalists or travelers of all ages. Perfect diary for girls and teens for keeping secrets safe and budding writers to jot down ideas for the next successful novel! 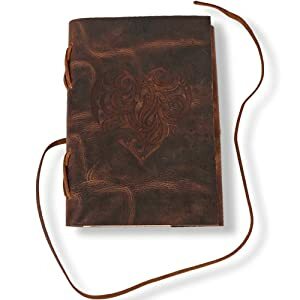 Each hand made journal is truly unique so no two are exactly the same.The crazy horse leather cover ages beautifully: when scratched the markings look uniquely distressed – wipe and the marks fade. The more you use it, the more rustic it looks. Beautifully Soft & Supple Dark Brown Genuine Leather with distressed finish. 240 Pages (counting both sides) unruled pages with a creamy color 7x5 sheet. Due to handmade "X" cross-binding, this journal is NOT refillable - Making them one of a kind!